Poppi the Coconut. He will be missed. I have a habit of personifying inanimate objects. A beloved (and mischievous) Mermaid pinata named Princess Fan-Fan is an inside joke amongst friends, I once refused to throw out an old coconut named Poppi after drawing a face on him (however, the mold got to be too much to bear) and I have brought my fake green cat, Pancake, to entirely too many restaurants to ever be considered a proper lady. 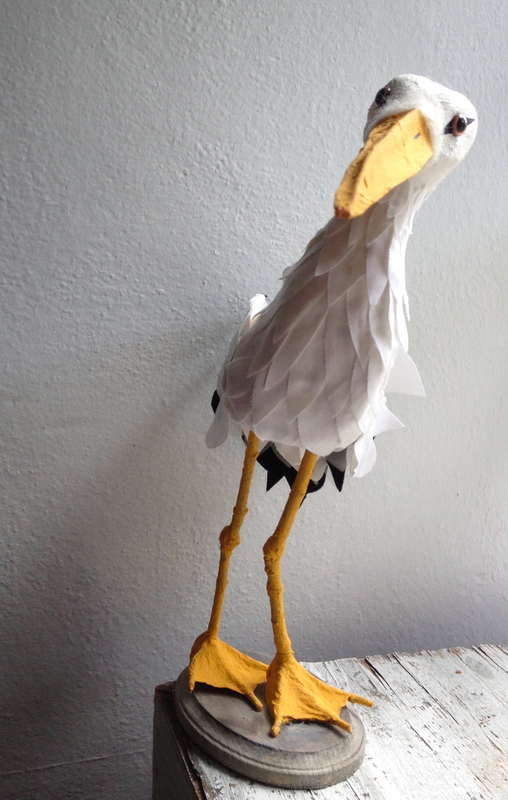 I'm thrilled to introduce my newest pet: a beloved creation of fabric, foam and branches: Flork the Stork. Soon to be appearing on an Etsy shop near you (update: she's up! ), I have come to terms with the fact that this girl will be given up for adoption, but it is still a tough cookie to swallow as she and I have grown quite attached. Flork is the first step in a new pet project of mine: creating a line of birds that you can pet without them biting you. The threat of contracting the bird flu has never stopped me from trying whenever I see a wild bird, but those of you that are a bit more cautious can now own your own personal pet-friendly bird that doesn't crap everywhere. Next in line is a pelican, and possibly a seagull down the road for those with a beach house? Word to the wise: one of them will be graced with the strong, masculine moniker of Princess Kerfufflefluff. That is a name with some charisma, my friend, but certainly not for those not fond of whimsy. Flork doesn't like close-ups, so I had to slip her a Valium before this shot. Excuse the glassy-eyed expression, she doesn't handle her valium very well. She has wonky legs, but don't say that to her face. Feel free to leave future bird suggestions in the comments!